"They were very professional, fair on cost and went above and beyond to make sure that I was satisfied. Jason was great to work..."
Pro Home 1 is a BBB accredited, licensed and award winning contractor that excels in deck building & deck installation projects. Decks can provide a much needed and important living space to your home. Designed and built the right way they also add significant beauty and enhance your home’s value. Well planned outdoor living spaces also create a spirit of vitality for your home with more choices for entertaining, gardening and even a quiet place to escape with a morning coffee. Whether you have a deck in need of professional replacement or want to start from scratch to create the perfect dream space, the designers and builders of Pro Home 1 are here to help at every phase from design, material selection, permitting to final construction. Get a FREE estimate today on a deck building project or any other deck services in the Wood Dale, Schaumburg, Mount Prospect, IL area by clicking the FREE estimate button below. If you can dream it, we can build it! If you're considering adding a deck to your home, give us a call or fill out our contact form to get started with your free estimate. 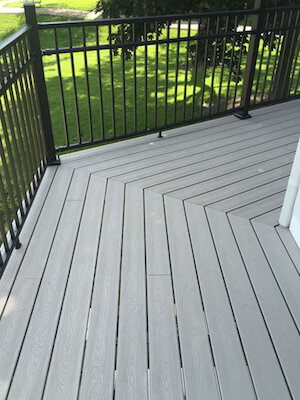 When it comes to decks, we are Dupage, Cook and Lake Counties' experts, serving Palatine, Arlington Heights, Des Plaines, Elmhurst, Lombard , Naperville, Wheaton and surrounding areas.